I have to brag about myself a little bit because that is what this page is for. But mostly I just want to brag about some of the incredible things my career has allowed me to do, the places being a vet has taken me and some of my favorite patients I met along the way. Being a veterinarian is all I have ever wanted. I guess I am not that original. As a young girl my Bible was James Herriot’s All Creatures Great and Small and my idol, Dr. Doolittle. 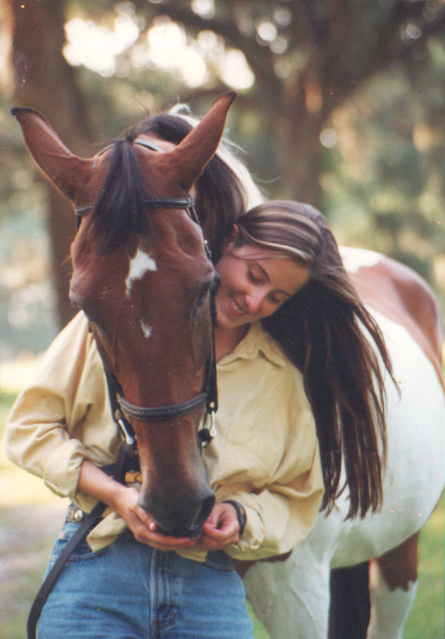 My first love was a 30 year old Heinz-57 horse named Cochise who was my partner in crime until he passed away at 42. Horses gave me a confidence every child should be lucky enough to experience and for that I am eternally grateful. Dr. Clabaugh's first horse at 37 years old. Caring for a geriatric horse inspired me to become a veterinarian and opened a world of opportunities. As a vet student I darted buffalo from helicopters in Africa, researched reproductive vaccinations for elephants and hippos, relocated endangered black rhino to safer game reserves, removed snares from lions and tested leopards for tuberculosis. I rode camels and brumbies in Australia and raced a cheetah on a mountain bike in Texas. I have worked for and trained with Olympians and Rolex riders and fallen off more horses than I care to count. As a new grad I got my feet wet in the Florida panhandle dodging alligators, snakes, and hurricanes to get to my patients. My rig was equipped with a chainsaw and a 10,000 winch to cut and drag my way through fallen trees at all hours of the night. The chance to work at an elite medical and surgical referral center took me to Oregon where I moonlighted as a Professor of Veterinary Technology at Portland Community College (as if working 60+ hours weeks as a vet wasn’t nerdy enough). I wrecked my motorcycle and ended up meeting my partner of over 10 years now at a motorcycle repair shop. Wanting to be near his family brought us to Hawaii in 2013. 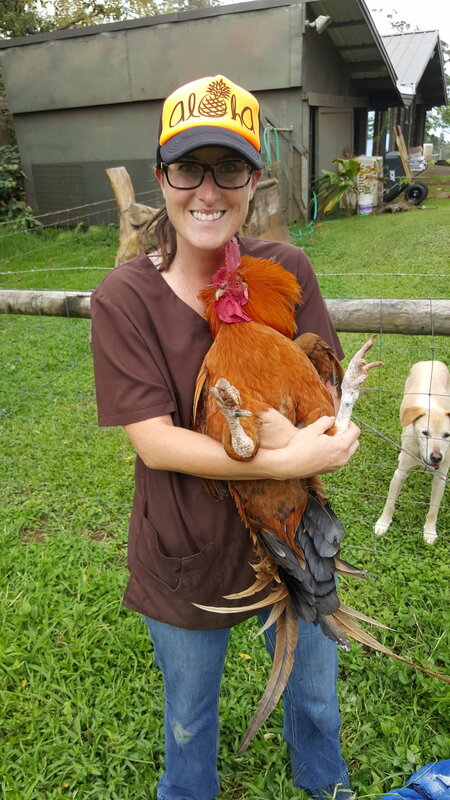 Working for Aina Hou Animal Hospital for 3 years allowed me to get to know Hawaii, its paniolo culture and many of the wonderful, eclectic, horse loving people that call Hawaii Island home. Aramat Equine Services came to fruition in 2016, the fulfillment of my dream to provide exceptional, individualized care to clients with whom I connect. I have always wanted to work for people like myself - who love their animals and who strive to learn how to best care for them. As a vet I am not just someone who comes by on emergency to stop the bleeding. I want to be the person who knows everything about your horse without having to look at the medical record, who has been there for you through ups and down, National Championships and weekend trail rides. I want to talk story with you at polo and will gladly answer your calls in the wee hours of the morning. Horses are our partners and I want to be yours. While being a vet is more of a calling than a career, I do like to take some time to enjoy this incredible place we now live. So when not working, I’m riding my mares, scuba diving and spending quality time with my loved ones. Derek and I brought with us to Hawaii our two Dobermans (Otto and Gryphon) and our three horses, my Thoroughbred Saphena, her son Andale and Miznah a rescued WB filly. Since we have been in Hawaii, our four-legged family has grown to include Guster, a Hawaiian Ditch Dog (as we call him), Zora (our new Doberman princess) Revel, a grade mare I adopted from the Humane Society, Anvil the Siamese and Saphena's latest filly, Pheight.